Come Run (Waddle) With Me! In Be Safe, Love Mom I tell the stories of sacrifices. Some of them are the daily rocks in your shoe variety that can build up over time. Others are much deeper, that cut to the heart. One of those stories is that of Lisa Hallett, Marathoner, Ironman Triathlete, mom of three, Gold Star Widow and a founding member of wear blue run to remember. Every day thousands of runners step out to run to honor the fallen, the fighting, and the families-and that includes the mommas. Whether you stand with a flag in a Memorial Mile at a marathon, run in a local road race, attend a Saturday morning meet up, or just step out there and walk with a name in your heart that you wish to honor, you are a member of the community. No fundraising, nothing fancy-you just are making a commitment of your steps. We know that Memorial Day is more than picnics. Let’s take some time to make our steps count. I would love to hear the Momma mileage and who you are running for. This year I will be running for my daughter’s great friend Valerie C Delaney . I will also be running for all the Gold Star Moms. I think about them every day but especially on Memorial Day. And one more thing-its funny how miles can turn tears into smiles when you are missing your sons and daughters. Onward. Meaningful Moms who show up and participate in life every day. God bless you my friend. 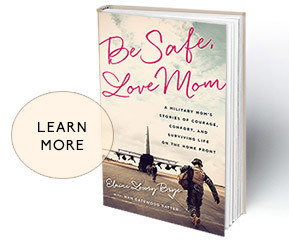 Connect with Elaine and other military moms! Please check back soon for upcoming dates!